The logical evolution of Throbber, Four-Way Zone provides four times the audio mangling power for the same low, low, in fact nonexistent price. • 4 independent LFO-driven effects in series: Autopanner, VCF, VCA, and flanger/echo, each with several operating modes. • LFOs can free-run over a wide speed range or sync to VST host tempo. • 13 unique LFO waveforms. 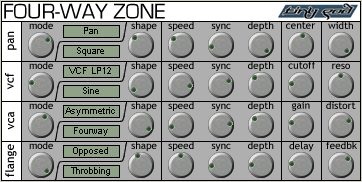 • Compact and straightforward custom GUI makes it easy to sound like your favorite '80s industrial noise band!